“And get another box of Jelly Slugs, dear, they’ve nearly cleaned us out–” said a woman’s voice. 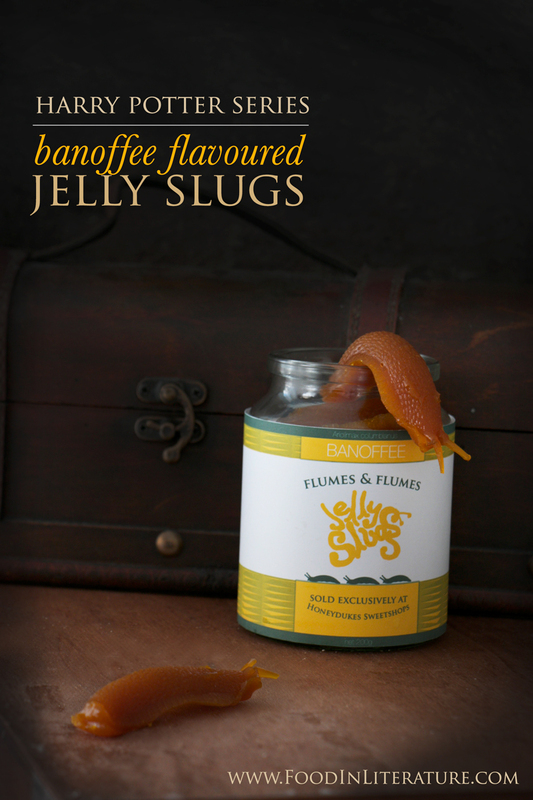 There’s little known about Jelly Slugs, other than that they’re sold at Honeydukes and seem to be quite popular. So I let imagination take over with this one. I knew I didn’t want a regular jello flavour of lemon or mango or lime. As I was researching slugs, I found out that there are banana slugs found in North America. From there I thought of banoffee pie, made of bananas, cream and toffee, an English dessert, created in 1971 in East Sussex. Fortunately, in the supermarket, they sell a jar of banoffee dessert sauce, so I decided to give it a go. Make these jelly slugs from Honeydukes, a popular treat in their Hogmeade shop. We've made ours banoffee flavoured! In a saucepan, over low-medium heat, stir together the jello, powdered gelatine and water. Stir until all is dissolved and the mixture has lost it's grittiness. Add in the banoffee sauce. Stirring, let it heat up, but don't let it boil or bubble, just until the sauce is smooth and flows off the spoon when lifted. Using a smaller spoon, scoop into the slug mold. Place the old into the freezer for 5-10 minutes, depending on how warm the mixture is, until it is firm and pops out of the mold easily. Repeat. If the mixture starts to firm up in the pot, just reheat slightly until it's smooth again. The slug mold was created using these two products, purchased via Amazon (affiliate links). Make more molds if you're in a rush. Looking for the packaging I’ve created? You can download it for free by clicking the image below, but only use it for private use. If I want to make mine a “normal” flavor what could I use instead of the sauce? Anything helps, thanks! Any jello flavour or thick sweet dessert sauce should do the trick. Hi, are these the same texture as jelly or more stiff? Also do they need to be stored in the fridge? How many days could have make these in advance? Eeeek, love these, Bryt…now all you need is slime to go with them! I knew I forgot something! 😉 That would be cool! I can’t find slug molds anywhere! Can anybody help? What’s the difference between the flavorless jello and plain gelatin? I’ve only seen plain gelatin in the US. Can I just use that? Yes. Knox unflavored gelatin works well. I’ve looked everywhere, even on the internet, for flavorless jello and it may as well not exist. How much gelatin do I have to use to make this recipe work? I really really want to make this and give it as a christmas gift to my friends, and I have everything I need except the amount of gelatin. Also, what kind of gelatin do you recommend? The actual slugs that you buy at universal are actually banana flavoured!! I made molds of the same toy slugs. As I couldn’t find banoffee dessert sauce in my country, I tried cooked condensed milk (which is sort of toffee) with banana flavour. Worked quite well. I’m going to try condensed coconut milk (as my son has dairy allergy.) when you used condensed milk did you cook it down first? Did you substitute equal volume as the banoffe? For the banana slug, you could add condensed down coconut milk or cream, as you mentioned in the other comment, and use a banana food flavour and a toffee food flavour (making sure it’s dairy free). But there are different types of slugs in the world, so don’t feel you have to make banoffee. There are red slugs, so a raspberry dessert sauce could be another option.